Vertical mice promote a neutral 'handshake' style grip that some buyers find reduces wrist pressure and pain associated with Repetitive Stress Injuries (Source). This is because the natural resting position of your forearm and wrist is a ‘thumbs-up’ position. Compare this with the rotated position standard flat mouses create (Source). This palm-down position is called pronation. Vertical mice are designed to prevent potentially damaging pronation (Source). Wrist and hand pronation can cause painful tightening of wrist and hand. Additionally, pronated positioning means that computer users will oftentimes singularly rely on using only their wrist to move the mouse (Source). These movements, (radial: towards the thumb and ulnar: towards the pinky finger) can heighten pressure in your carpal tunnel (Source). The benefits of vertical mice include the promotion of a forearm rest position that decreases muscle use. Decreased compression of the wrist's soft tissue. Promotion of a comfortable neutral grip, with the mouse maneuvered by the larger muscles of your arm and not your wrist (Source)​. Buyers we spoke with, for the most part, experienced pain and pressure-relief using these ergonomic devices- though it's no guarantee that they will solve your specific problems. It's best to experiment​ and return the item within a couple weeks if it doesn't work for you. The FotoFo and Anker are both wireless options, while the rest are corded. Buyers say that the Anker elevates your wrist to about 65 degrees to help reduce wrist tension and pain. Another reviewer tells that it has almost completely eliminated elbow and shoulder pain- specifically during long computer work sessions. While it's not as advanced as a top-flight gaming mouse, another buyer told us, this handshake-style mouse has the important benefit of potentially minimizing crippling repetitive stress injury pain. I like to have a mouse for either hand and when I used a generic mouse in my left hand I began developing painful tightness in my left wrist. Since I've begun using the Perixx left-handed mouse, this tightness has dramatically alleviated. I will say, though, that the vertical orientation takes some getting used to. I downloaded a Perixx driver from their website so that I could change which of the two top mouse buttons click. I preferred having my left hand's middle finger​ be the 'primary' click and my index finger be the 'secondary' click. I think, in general, when it comes to vertical mice, your experience will vary depending on the pain condition you're trying to alleviate and a bunch of variables including the size of your hand, how you sit in a chair, and general musculature differences. Though it might seem kind of weird, I'd actually recommend having 2 active mice at your computer workstation if you suffer from a repetitive stress injury or just general hand fatigue. If you toggle between right and left hand mouse use it lets one wrist rest while the other compensates, and vice versa. This wireless ergonomic mouse offered by Anker is a solid option if you are looking for a vertical mouse. Users like the functionality and ergonomics of this mouse, but some do complain about its size and certain technological issues. This product’s ergonomic design encourages healthy neutral “handshake” wrist and arm positions for smoother movement and less overall strain. The optical tracking technology provides more sensitivity than the standard optical mice for smooth and precise tracking on a wide range of surfaces. It enters power saving mode after 8 minutes idle, and all you need to wake it up is to press right or left button. This item seems like a solid choice if you’re looking for a vertical optical mouse. The general user consensus concerning the Anker ergonomic vertical mouse is that it is well built and comfortable. Many users state that this product is great for people who suffer from carpal tunnel syndrome or elbow pain. Purchasers say that is much easier to use it than the standard mouse because it imitates the natural position of the hand. However, some buyers complain about it being uncomfortably large and that it is hard to get used to it. Many buyers experienced issues with the product, such as poor connection with the computer, the mouse not moving smoothly, as well as the item not working after several months. This scroll endurance wired mouse offered by J-Tech Digital is a good option if you are looking for a vertical mouse with adjustable sensitivity. Users love the ergonomics of this product, but some do complain about the size, scrolling and precision. 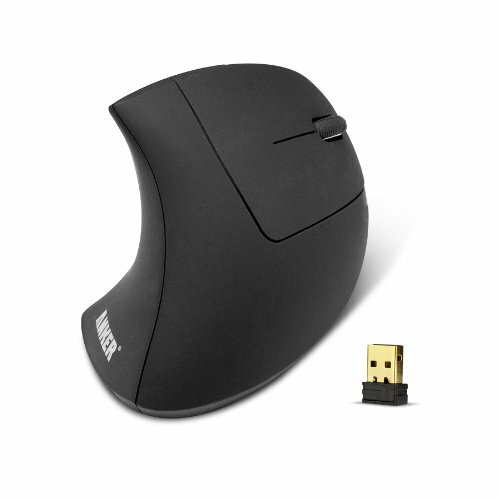 This product is perfect for anyone who experiences wrist or hand fatigue when using a regular mouse. The Scroll Endurance Mouse features a detachable palm rest to reduce drag on the desk surface. Another feature is adjustable sensitivity, which can be changed on-the-fly using the DPI button on the mouse. This USB vertical mouse might be a good choice for those who experience torsion of the forearm and wrist when using a standard mouse. In general, users have a favorable opinion of the J-Tech Digital Scroll Endurance Vertical Mouse.What they praise is that it has excellent button placement and removable rest pad, as well as great verticalness. Therefore, as the users conclude, this product is good for people with wrist problems, as well as for the DPI users. However, some buyers complain about the scroll wheel which doesn’t have a click (the texture when scrolling gets inconsistent) and the item being too small. Other purchasers find it hard to move and difficult to achieve precision. One online reviewer shares that the item is somewhat heavy due to two weights inside, but gives advice on easy removal. This long-range wireless mouse offered by Logitech is a good option for those who need a wireless (but not a vertical) mouse. Users love the product for being a pain-reliever, but some do complain about certain performance issues. This product’s sculpted shape supports your hand and allows it to stay in one place, moving the cursor without moving your arm. It connects up to six unifying compatible devices with one tiny wireless receiver that stays in your laptop. If you want a vertical mouse with up to 30 ft. wireless range,this might be a good option. In general, users have a positive opinion of the Logitech long-range wireless vertical mouse and they agree that it is a great solution for carpal tunnel and wrist pain. As they say, it’s very comfortable and the trackball does its job well. One buyer advises placing a wedge with a 30-degree incline under it to make it more ergonomic (and experimenting with different angles to find the best fit for you personally). Even though it is said to be very good for daily use, purchasers agree that it is not the perfect choice for gaming. Many purchasers complain about inconsistent and unreliable click actions and apparent lack of durability. Others complain about the trackball not scrolling fast enough. If you are looking for a top-rated right-handed vertical mouse, you might want to consider this one offered by Evoluent. Users love its design and performances, but do complain about the price. This product has a thoughtfully sculpted shape for comfort and easy-to-reach programmable buttons. It features two thumb buttons and an extra wide lip along the bottom edge which prevents the last finger from rubbing the desk. The pointer speed controls on the side allow convenient adjustment without even releasing your grip from the mouse. This regular size right-handed vertical mouse could be a solid choice if you’re looking to avoid forearm twisting. In general, buyers have a positive opinion of the Evoluent vertical mouse. They state that it is comfortable and that it has an awesome ergonomic design. Most of them agree that it is good for anyone with the wrist or elbow pain due to long hours working with a computer mouse. One happy purchaser shares that it eases her wrist pain, and is actually faster for many tasks than a conventional mouse. However, many buyers state that it’s not the cheapest option available and that it has mediocre quality for the price. One dissatisfied purchaser complains of the terrible finish/coating. If you are looking for a vertical mouse, you might want to consider this 5-button wireless vertical mouse offered by FotoFo. Users love its ergonomics and design, but some do complain about its durability, as well as some technical and design drawbacks. This product features a high-resolution optical sensor with adjustable sensitivity for accuracy and responsiveness. Its scientific ergonomic design encourages healthy neutral “handshake” wrist and arm positions for smoother movement and less overall strain. It comes in three colors: black, blue and grey. 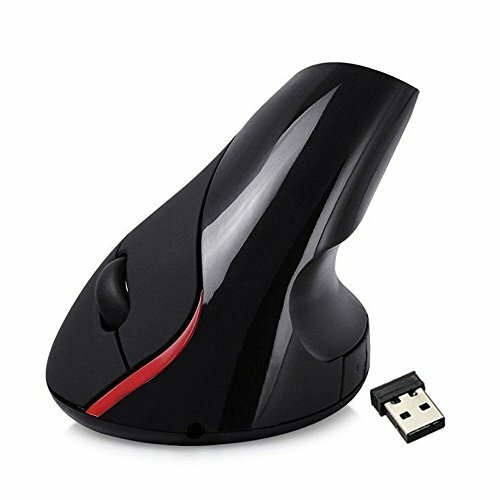 If you are looking for an ergonomic computer mouse, this 2.4GHz wireless vertical mouse might be a good option. In general, users are happy with the FotoFo vertical ergonomic mouse. What they like in particular are its ergonomics and great design. All in all, they agree that it is great for people with wrist pain. As they say, it is more comfortable and even easier to use than a regular mouse. However, some purchasers have complaints regarding the durability. Plus, some say that it doesn’t hold a click very well. Several dissatisfied purchasers complain about the position of the buttons, as well as about the fact that this item is much heavier than a non-ergonomic mouse. 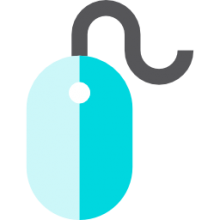 The first vertical optical mouse we examined is manufactured by Anker. It's marketed as an ergonomic option and designed to promote neutral arm and wrist positions- meaning you're guarded against repetitive stress injuries like carpal tunnel syndrome and cubital tunnel syndrome, they say. It's built with 800, 1200, 1600 per image resolution tracking- this means that it provides heightened sensitivity for especially precise and smooth tracking across different mouse pad service areas. As well, it will enter into a sleep mode if you don't use it for eight minutes and it utilizes next and previous buttons which helps when you're browsing the Internet and want to go forward or backwards in a browsing session. 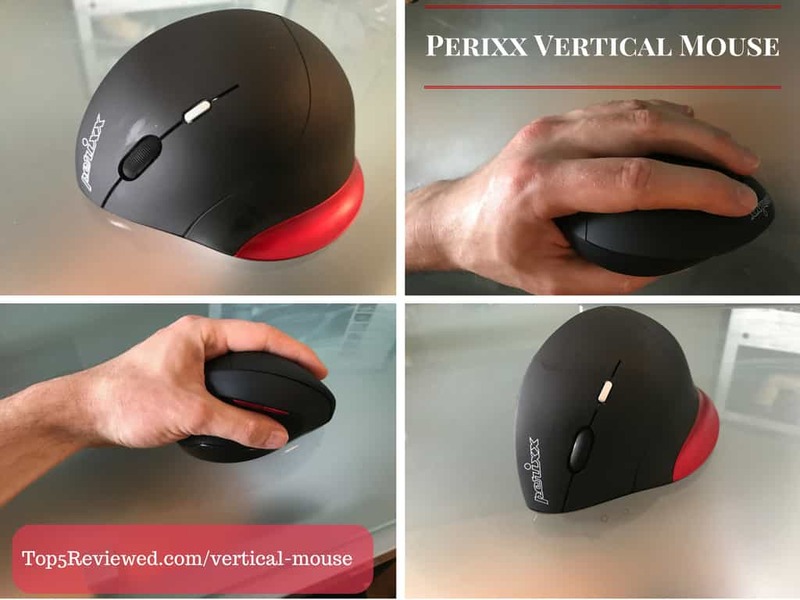 Perusing their marketing materials, this wireless vertical mouse is said to reduce hand strain by promoting a natural hold while also providing customizable settings that are compatible with all versions of Windows, Linux and Mac operating systems. The one thing about Mac operating systems is that the two thumb buttons will not work with Mac OS X. One buyer we spoke with who suffered from uncomfortable wrist pressure using a traditional-style mouse tells us he is pleased with the fit of the hold- saying that its rubber matte finish provides a comfy grip. Reviewers say that it creates a handshake-style grip at about 65° that some buyers say dramatically reduced wrist tension while using it at work for extended periods of time. Honestly, everyone's situation is a little bit different- so you may need to purchase a few of these computer accessories to discover the one that provides the most pain relief for you. The second vertical mouse we examined is manufactured by J-tech Digital- it features a removable palm rest and is engineered to decrease wrist and hand pain. Perusing their marketing materials, they describe utilizing a DPI shift design- what this means is you can adjust the DPI resolution for heightened response time. One buyer was fairly impressed saying that it helped decrease wrist pain, though he complains that it's weighted down with unnecessary screws, which he ended up removing to make it later. As well, another reviewer complained of planned obsolescence- saying that inside the rubber tire that works with the plastic wheel loses traction over time. This determined purchaser told us he was able to loosen the stopper to alleviate this problem, meaning he didn't have to purchase a new computer part. Other buyers were relatively satisfied- in general, they commended the interface, saying that the button placement was intelligent, the rest pad easily removable and the vertical grip is comfortable. On the downside, some buyers would've preferred a clicking scroll wheel. 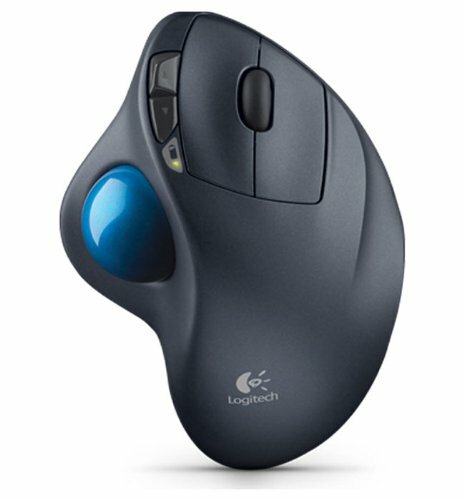 The third wireless mouse we examined is actually a traditional mouse- including an integrated trackball, an 18 month AA battery life, back and forward navigation buttons, as well as an ergonomic and hand-conforming designed to reduce the likelihood of repetitive stress injury development. One buyer who suffers from carpal tunnel disorder advises that if you raise it by 30° it promotes a healthier and more natural wrist angle that keeps you from impinging on wrist nerves. The fourth vertical mouse we examined was the Evoluent option. This right-handed computer acessory is marketed as an easy and comfortable to use option with an optical sensor that's adjustable, an integrated thumb rest, and a sculpted design engineered to promote healthy hand and wrist alignment during gaming or intense work sessions. 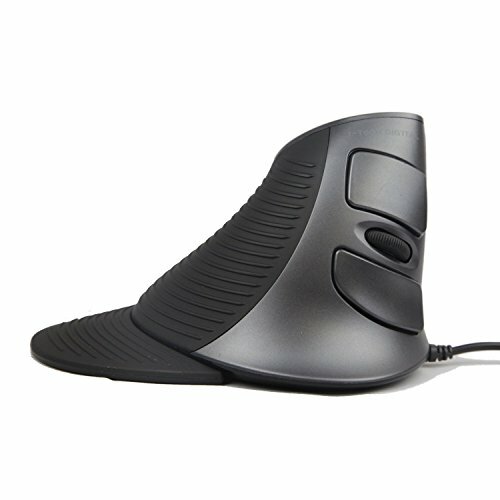 One buyer consulted with an ergonomic specialist prior to purchase and tells us that with traditional mouses the flat-style-use it encourages can put inordinate pressure on forefinger tendons- and vertical mouses help to rotate the rest into a more comfortably neutral position that decreases the pressure. This is a wired option that plugs into the USB. Another buyer who suffers from a connective tissue disorder that causes him to experience muscle and joint pain tells us he purchased it to promote healthier anatomical positioning- he recommends it for the most part though does criticize that it doesn't put your hand into a completely vertical position. Another buyer with some pain from a repetitive stress injury tells us it didn't work for him- he ended up going for a semi-vertical option which he manufactured using duct tape that had a better effect on his pain. Other buyers experienced significant drop-offs of pain, saying that its vertical design eliminates the twisted hand position traditional mouses promote, creating a more comfortable user experience at computer desktops and laptops. 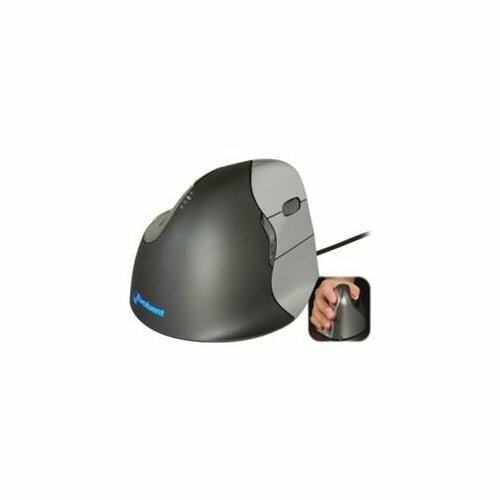 The last option we examine was the Fotofo vertical five-button mouse- it comes in blue, black and gray color options designed to ergonomically reduce wrist pressure. One satisfied computer user tells us that straight away it felt like a more comfortable grip- helping to reduce neck, shoulder and wrist pain. A MacBook Air user found that it was compatible Wi-Fi, also recommending how easy it was to recharge using a USB connection. One buyer did complain about its durability, saying that after less than half a year it stopped working.